TRIVIA of Noh : Q100 : What kind of relationship exists between shoulder drums and hip drums? | Home | Trivia | Q100 : What kind of relationship exists between shoulder drums and hip drums? What kind of relationship exists between shoulder drums and hip drums? 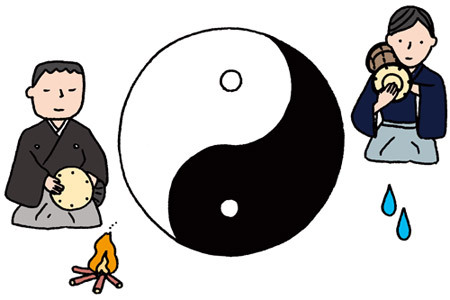 Onmyōdō (the principle of yin and yang) is a traditional Oriental philosophy. All phenomena are classified into two opposite parts, yin (the negative) and yang (the positive), and harmony between the two is important. Various aspects of Noh have been influenced by the principle of yin and yang, including dance forms and the structure of chanting. Drums are another example of this influence. A hip drum produces a high-pitched sound when it is heated with charcoal fire to dry the drumheads before the performance, and the instrument is classified as positive. Conversely, a shoulder drum produces a duller sound, and classified as negative. In terms of rhythm, the hip drum mainly has charge of the odd beats, which implies the positive side, while the shoulder drum has charge of the even beats, which implies the negative. In his theoretical work "Fūshi Kaden," Zeami says that success comes from harmony between the positive and the negative principle. One way to appreciate Noh plays is by focusing on the principle of yin and yang.